The recorded data provided by the impact logger, based on an OEM version of a Tinytag count logger, provides information about sediment transport, erosion and deposition in rivers and streams. Research Equipment Developer Ian Benson has used Gemini data logging technology to create custom-made impact data loggers for scientists studying sediment movement in rivers. Based on a Tinytag Plus Re-Ed OEM count input data logger, built into a stainless steel enclosure, the technology is used to study waterborne sediment transport, providing information on the basic physics of how turbulence influences sediments, including geomorphology, studies of erosion and deposition. The loggers are used by colleges and other organisations in the UK, Chile, Switzerland and other countries for counting the impacts of sediment particles in rivers, with the projects in Chile and Switzerland studying upland streams fed by glacial meltwater. The loggers allow the recording of high frequencies of impacts over long sampling periods. Recorded data is used in research and reports, which may include management advice to authorities such as National Parks or the Environment Agency. Ian has found the Tinytags to be rugged and reliable. He comments, "The shape and specification of the units and the ongoing continuity of the design is crucial for doing science where there is limited space in the enclosure and the physical behaviour (mass, stiffness etc.) of the overall assembly must be consistent in ongoing studies that run over a number of years. I have also found Gemini Data Loggers' technical support to be excellent." 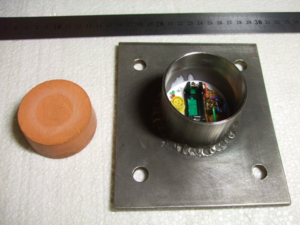 The image shows the TGPR-1200 Re-Ed count logger built into the stainless enclosure.